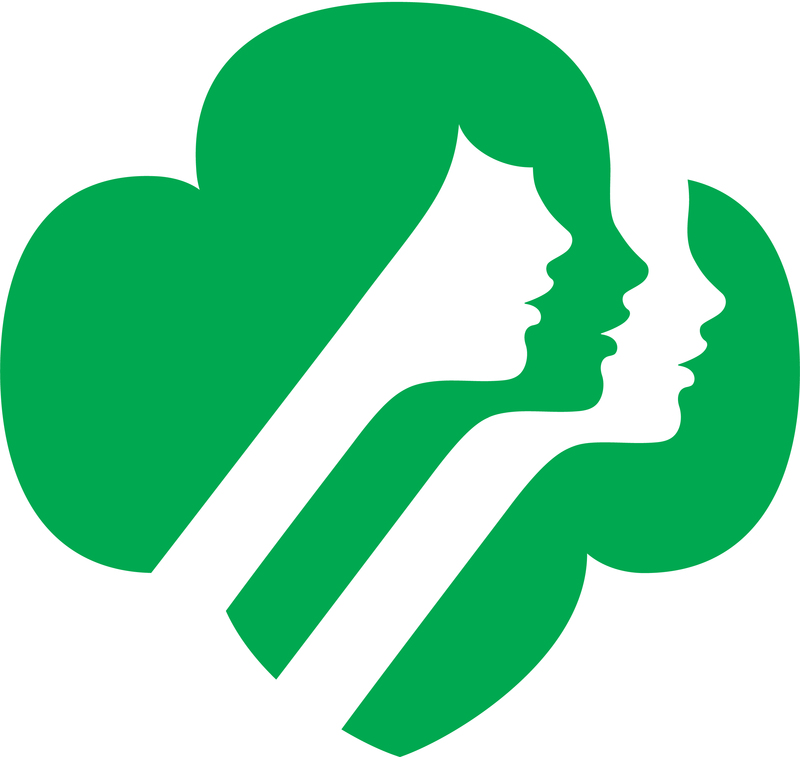 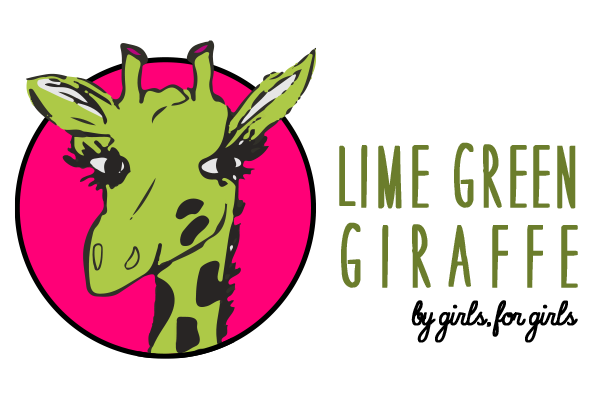 By: Lime Green Giraffe Social Director, Mimi M.
Ever want to try and knit a blanket, or a pillow, or something, but couldn't because of the needles, or because it was too difficult? 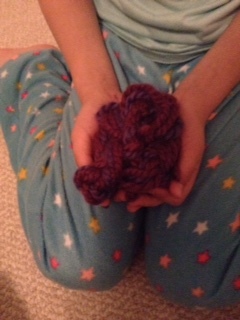 Well, with arm knitting, you can knit beautiful things without the needles! 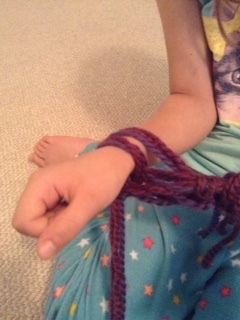 Arm knitting is simple, and cheap. 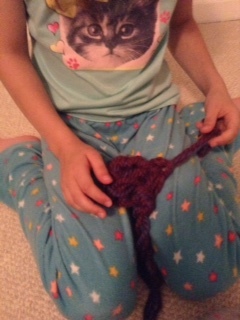 All you need is yarn. 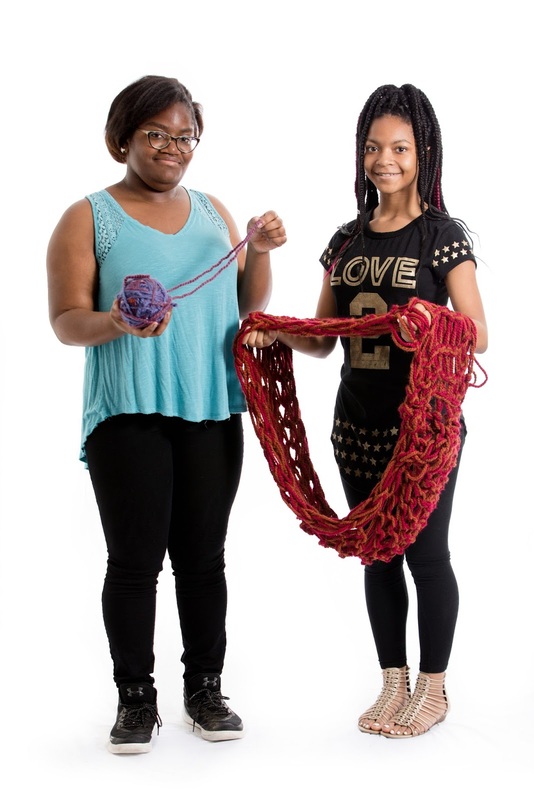 Chunky yarn, such as Lion's Brand Wool Ease Thick And Quick (Wool/Acrylic blend), which you can buy at national chains such as Jo-Ann’s, Michael's, or Walmart, works best. 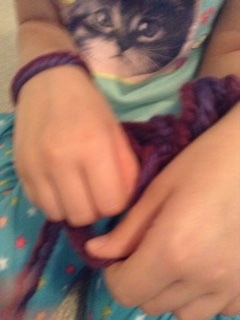 It is best to use 3 skeins of yarn at once to give your work a fuller effect. 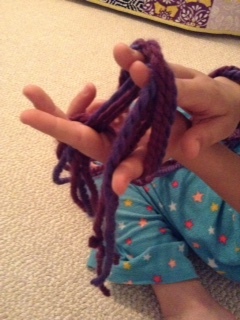 To start off, take all 3 ends of the yarn together and make sure that the yarn can unfurl easily from the skeins. 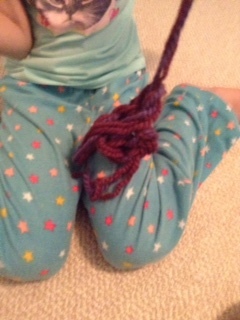 Then, one and a half yards from the end of the yarn, make a slip knot. 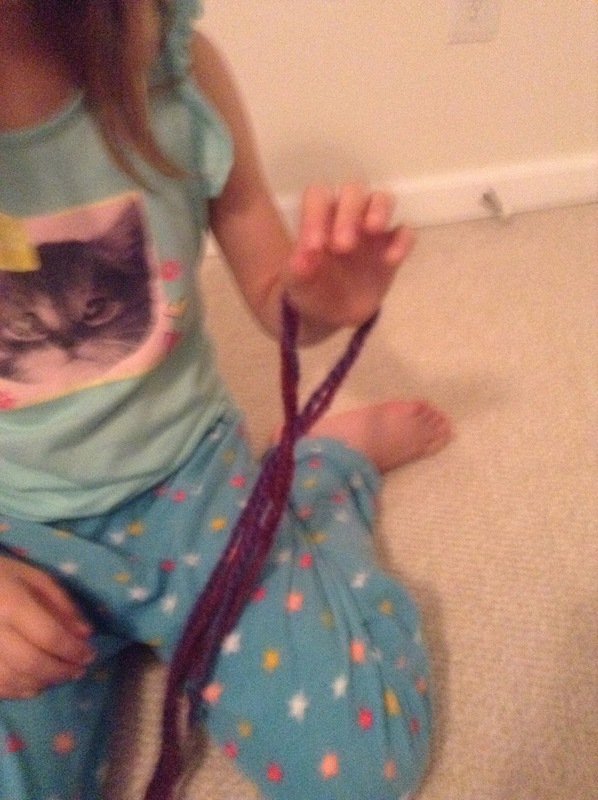 You can do this by making a loop with the tail (the end of the yarn) over the working yarn ( the yarn that is coming directly from the skein) and pulling the tail through the loop. 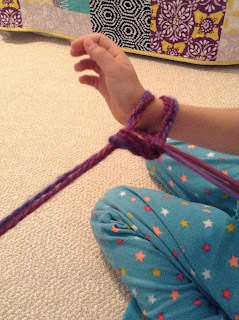 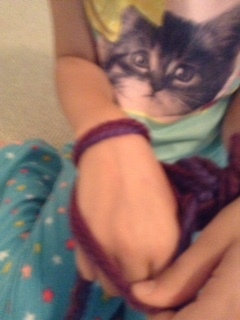 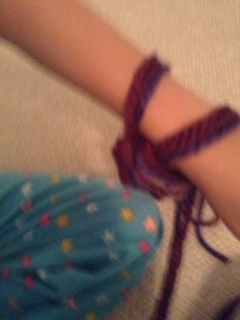 Then, put the knot on your arm and tighten it to however tight it needs to be. 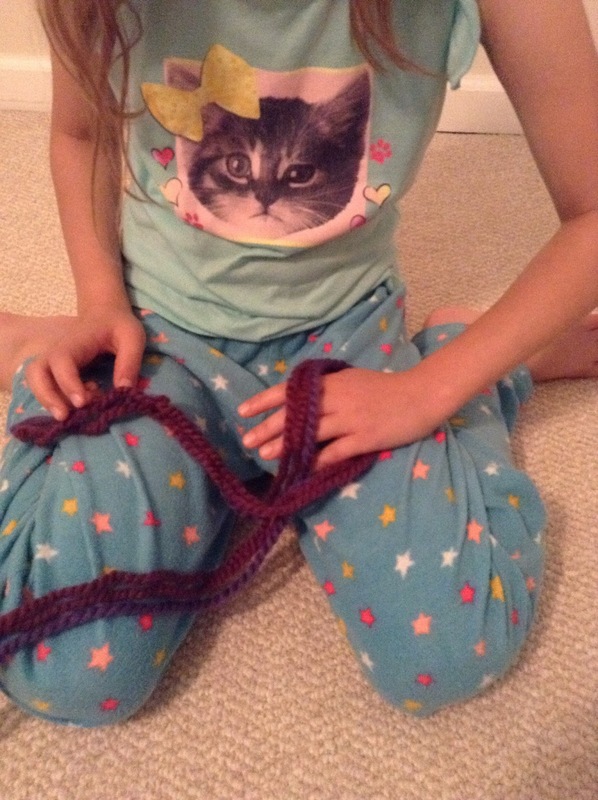 To make bigger stitches, keep the stitches loose. 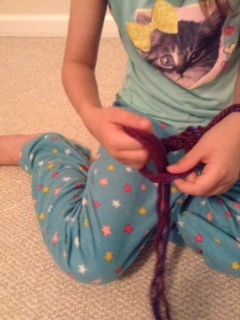 Smaller stitches should be tighter. 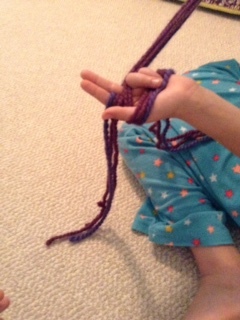 To cast on the other stitches, take the yarn that’s attached to the skein (the working yarn) with your left hand. 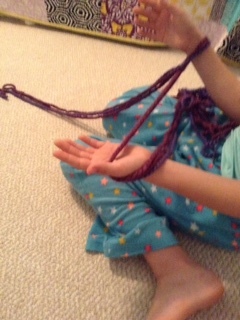 Wrap it behind your thumb and use your ring and pinkie fingers to hang onto it. 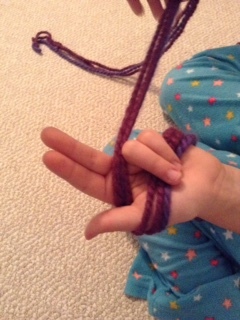 Grab the tail end of the yarn between your pointer and middle fingers.Place your right hand up through the loop wrapped around your thumb. 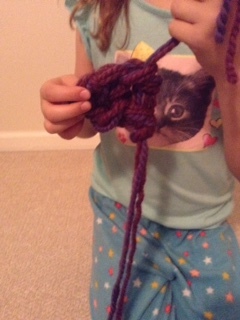 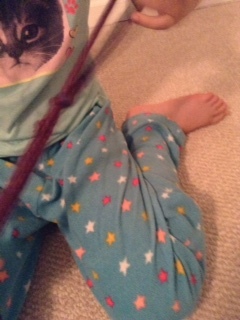 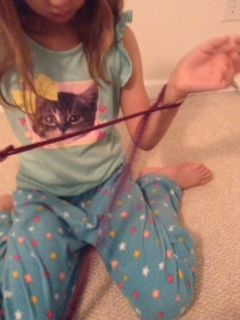 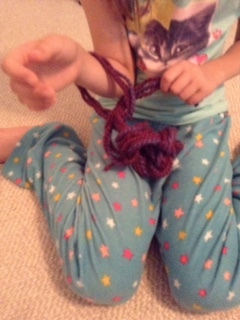 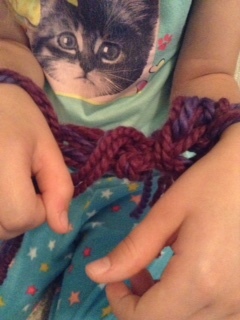 Grab the yarn tail with your fingers, and pull it through the loop. 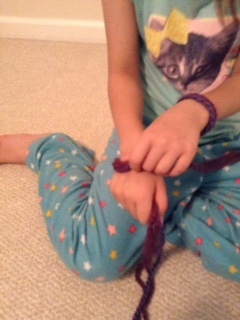 Then, put the loop on your arm to create the second stitch. 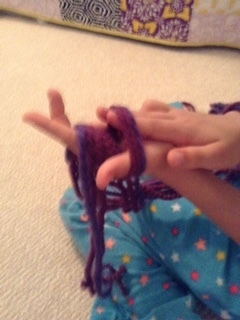 Keep on doing this as many times as needed to make your project wider or thinner as needed. 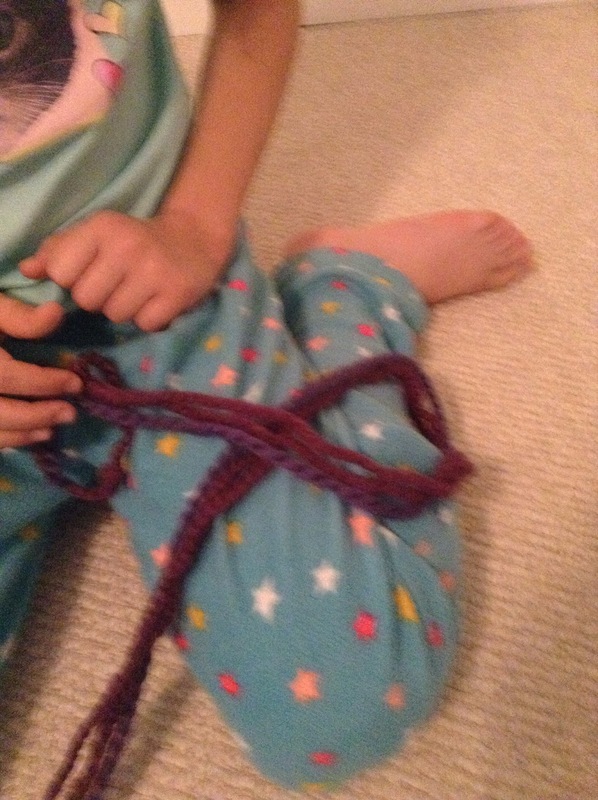 To do a simple scarf, cast on ten stitches in all. To transfer the stitches over to your left arm, grab the working yarn in your right hand, and pull your first stitch over it. 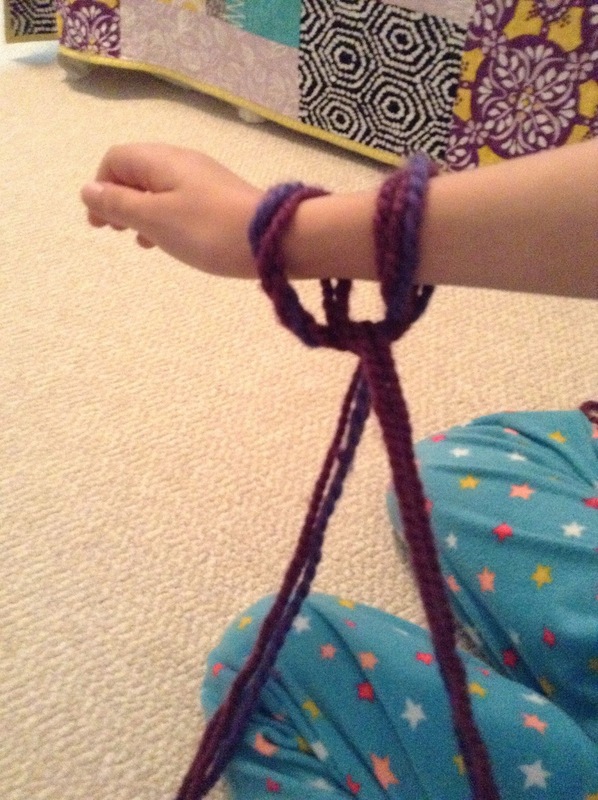 This should create a new loop. Put it on your left arm and adjust it. 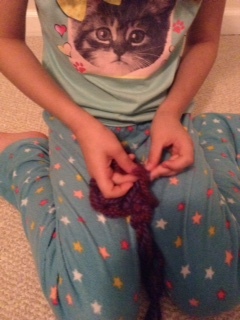 Knit two stitches, like you did for each row of the scarf. 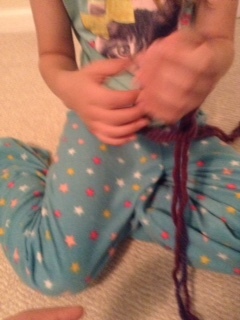 Then pull the first knitted stitch loop (the one closest to your elbow) over the second knitted stitch loop (the one closest to your wrist. 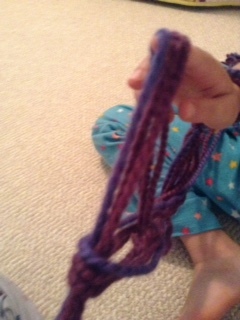 Then drop the loop that you just made. Keep on doing this by making one stitch, and pulling the stitch closest to your elbow over it and dropping it. 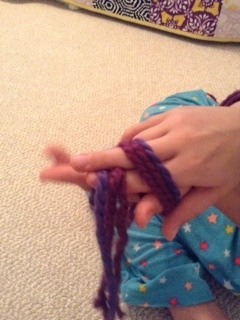 Keep on doing this till there is only one stitch left. 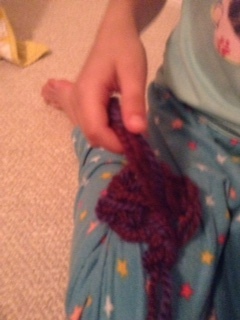 Cut the yarn (but keep about 6 inches left) and pull it through the last stitch. 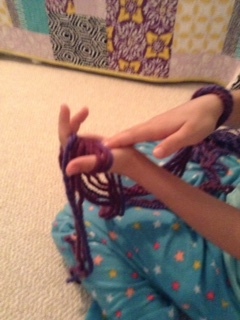 Finally, weave the yarn through the stitches. 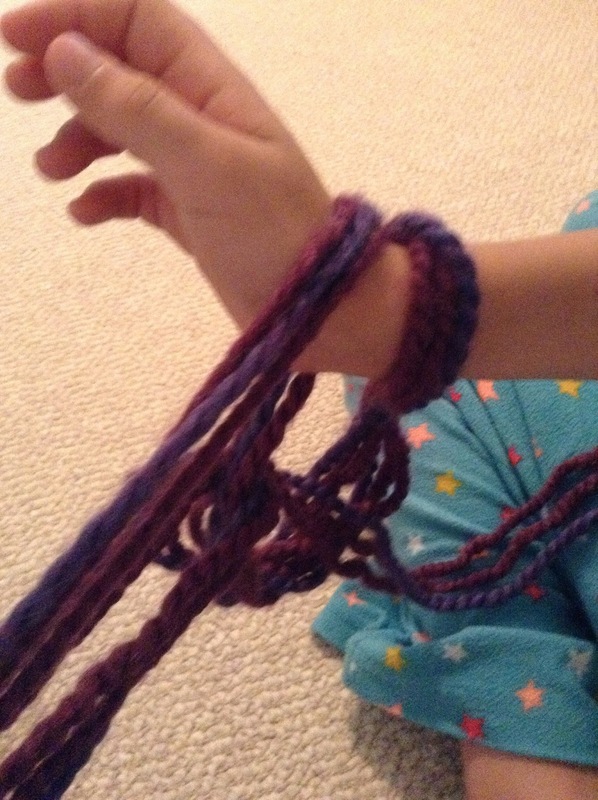 If you are making a project where the end come together (like an infinity scarf) then do the same thing, but when you cut the yarn, keep enough to go around the edge of your knitting twice. 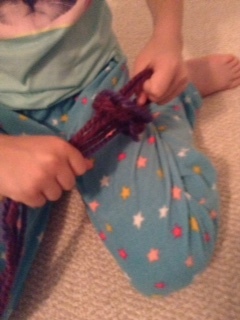 Pull the yarn through the last stitch, and then pull the two edges together. 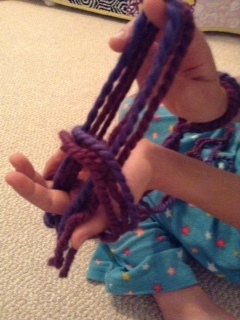 Stitch them together by pulling the yarn end through a loop on one side, and then do the same for he other side. 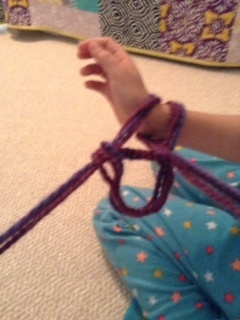 Keep on doing this for the whole thing, then tie a knot when it is all closed. 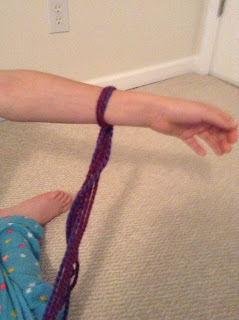 You have now successfully completed your arm knitting project.